Many kids today are reaching new heights by ascending climbing walls at school or by doing the real thing and scaling mountains with their families. 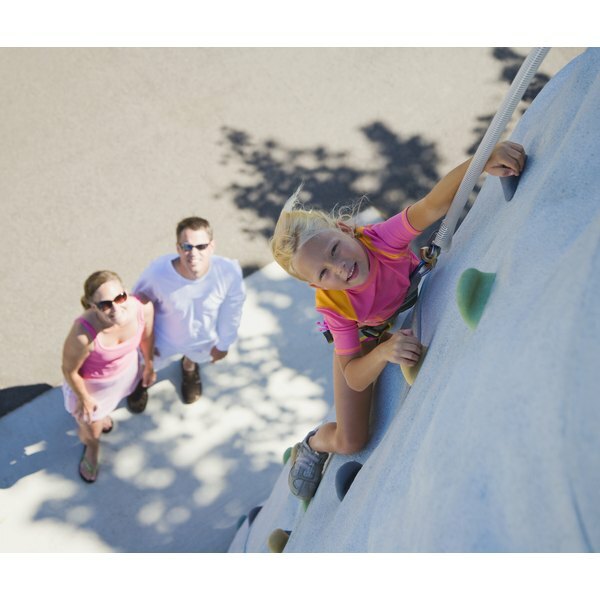 Rock climbing is a fun and challenging activity for children. It also offers kids both physical and mental health benefits. Educate yourself before you take up rock climbing, to make the experience safe and enjoyable for your family. A climbing wall offers a good way for a child to begin. You'll find walls of various heights and difficulties in schools, gyms and even state fairs. Some climbing enthusiasts build these walls inside their homes. The walls contain polyurethane climbing holds that children grab. Some climbing walls are flat, whereas other more challenging walls have textures and overhangs that simulate mountain surfaces. Kids can improve their climbing skills on basic walls before attempting to ascend more advanced structures. Safety must be a top priority in rock climbing, as mistakes or accidents can lead to hazardous falls. Adults should always supervise kids' climbing sessions. Knowledgeable adults can help kids better understand climbing techniques and keep them from developing unsafe habits. Use a mat as a safety precaution at the bottom of basic climbing walls. Kids must wear the appropriate gear if they become serious rock climbers, including a helmet, climbing shoes and a harness. A rock-climbing harness attaches to a rope and protects climbers from falling. The harness should not be too loose, or it may slip off the child. A belaying device, which helps control a child when he is rappelling, should also be attached to the harness. Rock climbing is a total-body workout for kids. It improves their muscular endurance, flexibility, coordination and balance. Rock climbing also builds self-confidence, as kids can set goals every time they reach a new height. A child’s self-confidence gets a boost each time she accomplishes one of these goals. Mountain climbing also gets kids out of the house so they can enjoy nature. Rock climbing can also help kids develop focus and concentration. This is especially beneficial to children with disabilities such as autism. Autistic kids often have more sensory needs than other children and rock climbing helps them develop their fine motor skills. Children with physical disabilities can also enjoy rock climbing. For example, an amputee can rely on the strength of his other limbs to help him climb. Some climbing gyms offer special programs for children with disabilities. Rock Climbing For Life: What are the Benefits of Rock Climbing?